← Parma Number 25: The Monier Hotel … Only 25 more Parmas to go!!! 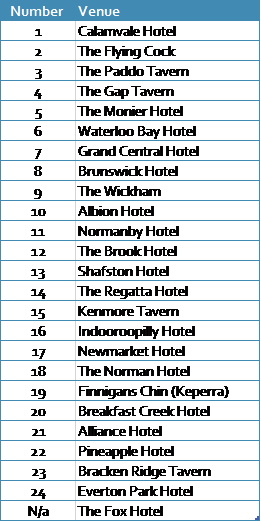 At the half way stage the Calamvale Hotel has maintained its spot at the top of the ladder whilst the Everton Park Hotel languishes at the bottom. Will there be a chicken parmigiana that jumps out and takes the lead or has Brisbane’s Best Parma already been found? Watch this space! This entry was posted in Uncategorized and tagged chicken parma, chicken parmigiana, parma ladder. Bookmark the permalink.